Energy efficiency; consumers demand it and product development teams strive for it. These days, it is also the focus of advertising and packaging designs for nearly all home and industrial equipment. From light bulbs to dishwashers to automobiles, the amount of energy consumed is a major factor in the research and development (R&D) of new products, not to mention their ultimate purchase by the end-user. Pool heaters are no exception. In fact, the various types of pool heaters on the market are often compared to each other based on energy efficiency. The four available heating technologies in the pool industry are gas (natural gas or propane), heat pump, electric resistance-style (very few pools use these systems anymore), and solar. It is generally understood that heat pump technology is more energy efficient than gas, while electric resistance-style heaters are less efficient. Solar heating is the most efficient in terms of the cost of generating heat (it is free from the sun), but there are variables in how efficiently water is pumped from the heat source (e.g. roof-mounted panels) to the pool, as well as in the cost of the solar collectors. That being said, this article will focus on gas heaters as they are the most commonly used for pools and have changed the most over the past 30 years. Energy efficiency has been a primary comparison point for gas pool heaters since the ’80s with the introduction of millivolt electronic ignition. This technology provided noticeable energy savings over pilot igniters. Gas heaters have historically been categorized by their thermal efficiency rating. Units that can achieve thermal efficiency ratings above 90 per cent are considered high-efficiency heaters. The thermal efficiency of gas heaters is a measure of how much of the heat generated by the consumed gas is actually transferred to the water (as heat). That is, if a heater consumes 400,000 British Thermal Units per hour (BTUs/hr) of gas and uses 336,000 BTUs/hr to heat the water (because the other 64,000 goes to exhaust, by design), that heater will have a thermal efficiency rating of 84 per cent (336,000 is 84 per cent of 400,000). This is the typical range for most gas pool heaters today. By using high-efficiency condensing technology, some pool heaters have been able to achieve thermal efficiency ratings above 90 per cent. That is, the heater is able to use 92 to 95 per cent of the heat energy generated by the gas it consumes to heat the water, while very little energy goes to waste. (The energy that does not go into heating the water is released into the atmosphere as exhaust. 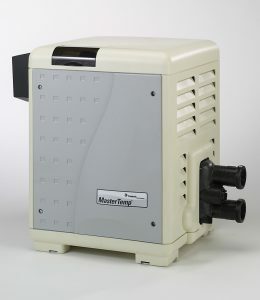 The first pool heater to use condensing technology and offer this level of thermal efficiency was the ‘Hi-E,’ brought to market in the ’90s by the company then known as Teledyne Laars. One of the biggest challenges of pool heater design—no matter the efficiency rating—is the harsh internal environment. This is a result of two factors: condensation and pool chemicals. Condensation that forms inside any pool heater, and especially those using high-efficiency condensing technology, is naturally very acidic, so the materials used must be able to withstand the corrosion caused by these environments. Heat exchangers inside most pool heaters are made of copper, which is a highly desirable material for heat transfer but is very susceptible to corrosion. By comparison, high efficiency residential hot water heaters for homes typically use high-grade stainless steel, which is not as susceptible to condensate corrosion. In contrast, pool heaters need more material for heat transfer because they have to heat a lot more water than typical residential water heaters. Further, it would be cost prohibitive to put the required amount of stainless steel into a pool heater to heat more than 180,000 L (50,000 gal) of water. Moreover, pool water chemistry is also proven to be harsh on stainless steel heat exchangers and could cause corrosion issues. 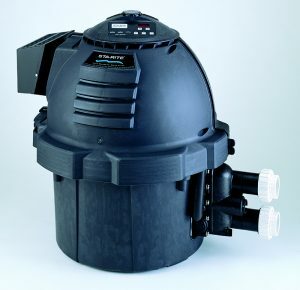 As a result, pool heater development teams have focused on emerging materials which can better resist corrosion in the pool environment, while also keeping them manageable in size and weight for installation professionals, equipment shippers and warehouse managers, and affordable for homeowners. Increasing thermal efficiency, while maintaining manageability and affordability, is an ongoing effort that is occasionally driven, for better or worse, by government regulations. About the same time the first pool heater to achieve thermal efficiency above 90 per cent came to market, Santa Barbara County in California implemented a rule requiring all heaters use condensing technology and be rated no less than 93 per cent thermal efficiency. This local regulation did not stay on the books for long (perhaps, at least in part, because these heaters were, at the time, much more expensive than other products available on the market), but it did set a goal for product development teams across the industry. Current regulations in some parts of the United States prevent the use of electric resistance pool heaters (e.g. California Energy Commission’s [CEC’s] Title 20 and 24 Appliance Efficiency Regulations) due to the high cost of electric energy. Another category of rules that have influenced some heater design changes came out of the South Coast Air Quality Management District (SCAQMD). Formed in 1976, SCAQMD is the air pollution agency responsible for regulating stationary sources of air pollution (that is, fixed appliances, not cars or trucks) in parts of Southern California. Other parts of North America typically look to California and SCAQMD, in particular, as precursors to regulations in other areas. For instance, Natural Resources Canada’s ‘ecoENERGY Efficiency for Equipment Standards and Labelling’ programs have historically paved the way for the introduction of new and more stringent standards, which are closely aligned with U.S. developments. In the ’90s, the Max-E-Therm® pool heater, then manufactured by Sta-Rite, met the low NOx requirements without requiring any modifications. In 1998, SCAQMD adopted a rule requiring water heaters and boilers with rated heat capacities up to two million BTUs to limit NOx emissions. (NOx emissions are the sum of nitrogen oxide and nitrogen dioxide in the flue gas, collectively expressed as nitrogen dioxide.) Any heater sold in areas of Southern California governed by SCAQMD had to meet the emissions limits. These regulations went into effect on Jan. 1, 2000. Parts of Texas implemented similar rules around the same time. 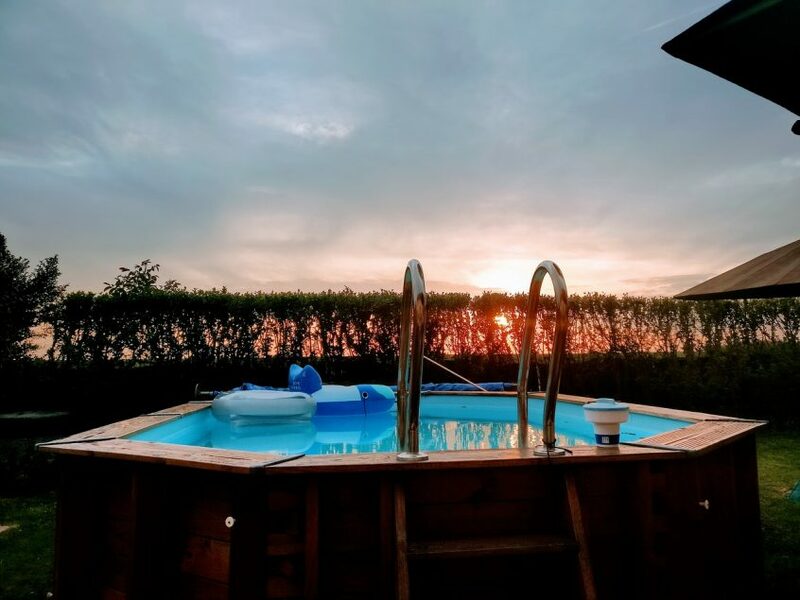 Anticipating the spread of these rules, some pool heater manufacturers developed new products or modified existing ones to comply with the low NOx emission standards. By the time the new rules were announced (in the ’90s), only one heater, Max-E-Therm,® then manufactured by Sta-Rite, met the low NOx requirements without requiring any modifications as it used pre-mixed gas technology with a forced-air ignition. Low NOx emissions requirements were influential in bringing about a new class of pool heaters 15 years ago. Forced air blowers and pre-mixed gas (PMG) technology created cleaner burning pool heaters with reduced emissions. Pre-mixed gas and forced-air ignition technology were used in other industries, such as domestic and commercial hot water heaters and boilers, before finding its way into the pool industry. Early on, gas heaters required natural air-draft to create sufficient air-gas mixture for ignition. For this reason, the industry refers to these as atmospheric or natural draft heaters. These products are still available, but as of April 2013, the U.S. government requires these heaters to be a minimum of 82 per cent thermal efficiency. As a result, this renders most atmospheric heaters obsolete as they can only manage, at best, approximately 60 to 78 per cent thermal efficiency. Also in 2013, Environment Canada’s Target 2.1: Outdoor Air Pollutants program was implemented to improve outdoor air quality by ensuring compliance with new or amended regulated emission limits by 2020, and thus reducing emissions of air pollutants in support of the Air Quality Management System (AQMS) objectives of the Federal Sustainable Development Strategy 2013-2016. Atmospheric pool heaters were typically larger in size and heavier because they had to accommodate multiple burners and their heat exchangers took up a lot of space. Further, to operate these heaters indoors, sufficient air draft/supply had to be provided. Perhaps the most significant reason for the shift away from using atmospheric heaters was the advent of new technology using forced-air blowers and pre-mixed gas (PMG). This technology enables heaters to draw outside air directly into the unit through a simple PVC pipe connection. This is especially useful for indoor installations where heaters are located in basements and small boiler rooms where ventilation would be insufficient for atmospheric heaters. Heaters using forced air and PMG technology also burn fuel cleaner, thus reducing emissions. Knowing this, it is easy to see why the industry is moving away from atmospheric heaters, at least in part, because they typically had to be installed outdoors to have sufficient air-draft. 110.5­—pool and spa heaters may not have continuously burning pilot lights. The latter has become a non-issue (and an easy regulation to comply with) as continuous pilot lights have not been used in the manufacturing of pool heaters since prior to the ’80s. In fact, they were being phased out even earlier. This was primarily because they wasted gas, and pilot-burning appliances consume more energy. The CEC does not allow electric resistance heating because it is extremely inefficient and expensive. As a result, this technology is no longer used for heating pools. Looking at product evolution in the context of related regulations is always interesting. In some cases, new regulations dictate or accelerate product development. In other cases, a new product or feature comes to market and a legislator or code writer—from local municipalities up to national and even international regulating bodies—learns about it, determines that it could solve a problem, and moves forward to propose and advocate regulations requiring its use. Some pool heater innovations came about for reasons that have nothing to do with regulations or standards. Rather, some modifications simply make the product safer or easier to use. The earliest generations of gas-fired pool heaters used either push-button pilot flame ignition, which is still used on some domestic tank water heaters, or millivolt type ignition, which is similar to the push-button spark switches commonly found on gas barbecues. Before the advent of electronic ignition and digital controls for pool heaters, homeowners had to manually ignite their heaters during initial start-up, or if the pilot light went out for some reason. Constant burning of the pilot flame used unnecessary gas and resulted in higher energy costs for the consumer. Constantly burning pilot flames work for residential water heaters because the demand for hot water comes when the water in the tank cools to a certain level (not to mention the tank holds approximately 150 L [40 gal] as opposed to a 38,000-L [10,000-gal] pool). When the temperature of the water in a residential water tank drops to a preset level, a gas valve opens and the heater fires up to heat the water. This technology works for a residential water heater, but not for a pool heater. Today, gas pool heaters use direct spark ignition (DSI) or hot surface ignition (HSI). Both are forms of electronic igniters. DSI provides fast ignition and solid construction; however, it also requires a high voltage spark generator. Spark intensity can be affected by deposits formed on the igniter; therefore, heaters designed with this type of ignition system must also have a separate flame sensing rod. On the other hand, HSI combines the igniter and flame sensor into one unit, so there is no need for a spark generator. This brings the cost of the ignition system down and provides reliable performance. The downsides to this type of equipment is the igniter is fragile, so care must be taken when it is being serviced or handled, not to mention it can crack over time. The move to electronic ignition provides a more reliable and safer ignition process as timing is more precise and the excess build-up of natural or propane gas in the heater prior to ignition is eliminated. Changes in pool heater ignition stemmed from the development of electronic circuit boards and the move to digital technology in the ’80s. Digital controls became the norm in virtually every category of consumer and industrial project, pool heaters were no different. In addition to bringing about changes in ignition, the digital technology revolution that started during this period led to great improvements in pool heater controls, which were brought to market in the early ’90s. This included digital temperature displays and controls on top of the heater which could be rotated to face any direction. Therefore, no matter how the heater is positioned on the equipment pad, the controls can be rotated so they can be conveniently read and adjusted. This feature can still be found on some of today’s units. In fact, almost all models have digital displays that show real-time water temperature, making adjustments more precise than simply pushing an up or down button for temperature control. Digital displays also allow for advanced settings, troubleshooting, and error display. This is not only convenient for homeowners, but also for service professionals and installers. Pool heaters have also seen changes in the internal and external (i.e. cabinet) materials. As plastics have become increasingly durable and sophisticated, some parts which used to be made of metal are now being replaced. A primary advantage of plastics is they are lighter, which reduces shipping costs and simplifies installation and service. When one person can carry a heater, rather than two, the equipment moves along the supply chain much easier. Again, looking back to the ’90s when innovations in pool heater design came to market, the first pool heater cabinets made with plastics became available. These units promised reduced maintenance, no corrosion or rust, less discolouration from sunlight, and generally greater resistance to the elements—inside and out. The strides the industry has made in the areas of ignition, digital controls, and the use of lightweight, more corrosion-resistant materials have been great over the past several decades and have contributed to pool heaters consuming less energy to get the job done. The next challenge will be developing new materials capable of withstanding condensation and pool water chemistry, both of which are highly acidic, without increasing the unit price too much for the market to bear. The newest generations of domestic water heaters use condensing ultra-high efficiency technology which provides thermal efficiency ratings above 90 per cent. Leading pool heater manufacturers are working on adapting this ultra-high efficiency condensing technology for broader applications in the pool industry. Finding new ways to adapt this technology so it can be more resilient and reliable in harsh pool environments could be a significant development for the industry. Higher efficiency heaters save energy, reduce pollution, and burn fuel cleaner. If the past is any indication of what can happen, there is always the chance that some governing body will decide all pool heaters should be able to achieve efficiency ratings above 90 per cent. This article was written by Azur Dzindo and originally appeared on Pool & Spa Marketing [link].